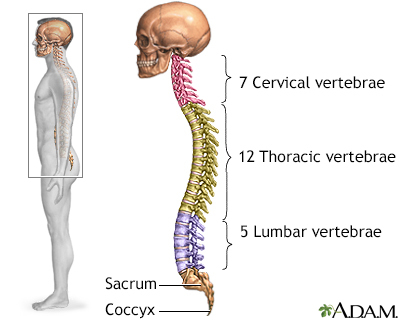 The spine is divided into several sections. The cervical vertebrae make up the neck. The thoracic vertebrae comprise the chest section and have ribs attached. The lumbar vertebrae are the remaining vertebrae below the last thoracic bone and the top of the sacrum. The sacral vertebrae are caged within the bones of the pelvis, and the coccyx represents the terminal vertebrae or vestigial tail.